We are created by many things: our upbringing, our experiences, the people who influence and shape our lives for better or worse, expectations, and more. Each of these things plays some part in who we become and how we view the world. But sometimes we have no desire to revisit the things that forged our character, preferring to sweep the past under the rug and push forward to the future, even if we really do need to face our pasts head on. The main character in Shelley Noble's newest novel wants no part of the memories or reality of her past but she's going to be forced to confront both. Vanessa Moran was raised in Whisper Beach. He father was an alcoholic and she's always blamed him for causing her mother's death and for his inability to love her. 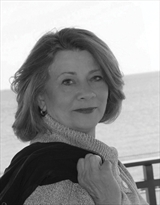 In order to survive, Van created a family of her own: Dorie, the owner of the Blue Crab Restaurant who not only gave the teenaged Van a job but also loved and advised her as a surrogate mother; her cousin Gigi, who was her best friend and was the person their whole group protected in all her sweet helplessness; Suze, the rich girl who was a constant disappointment to her mother but was loyal to her friends at the Crab; Dana, the good time girl who always had a bit of an edge to her; and Joe, Van's boyfriend and love of her life who folded her into his large and welcoming family. But when Van saw Joe in the backseat of his truck with Dana atop him, she made the mistake that would propel her away from Whisper Beach and the people she thought she knew. She got drunk, slept with a college boy whose name she never even knew, and ended up pregnant. When her father called her a whore and threw her out, with a little help from Gigi and Suze, she left town and built herself a life in Manhattan, cutting all ties with Whisper Beach. Now a very successful professional organizer proud of rising above her roots, she is reluctantly being drawn back to her hometown for the funeral of Gigi's husband. She has no intention of staying and dredging up all the things she'd rather keep buried. She'll go to the funeral and then head further down the shore to take her vacation in a place that doesn't remind her of what she once lost. But things rarely go as planned and Van discovers that she cannot leave her old friends high and dry again. Dorie is on the brink of losing the Blue Crab. Suze is frantically waiting for the second piece of a grant application that will allow her to take time off to write a book to further her academic career. Gigi is a fragile mess. And Dana, who Van wants to see almost as little as she wants to see Joe, turns up at Dorie's door badly beaten up by her cop boyfriend (and not for the first time). Van might have abandoned them once, but this time she'll try to help everyone fix their lives before she goes. As she wades into the challenges facing her old friends, she is still determined to ignore her own unresolved issues from the past, especially the issue named Joe because that one just hurts too much. Whisper Beach is a small place once the tourists go home though. Van finds she can't run forever, she's tentative but still strangely comfortable with Joe, and there's more than one side to every story, even those she thought she knew the truth of. The large ensemble cast leads to a plethora of story lines which are sometimes short-changed but in the grand scheme of things each of the plot threads needs to be there to further the story and reveal something about the friends and about Joe. The many characters are clearly unique and recognizably different from each other, not only in their professions and descriptions but also in their personalities. Van, as the main character who has risen above her unhappy upbringing is mostly sympathetic but occasionally she's incredibly frustrating too. The plot is generally predictable but in general the book is an easy, quick, and satisfying read that leaves just enough open at the end to allow for a sequel or just for the reader's imagination to create a perfect, feel-good ending for herself. 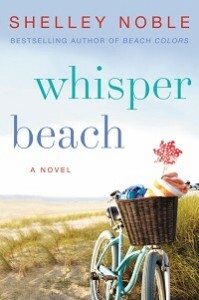 Whisper Beach is a warm sunny day of a read about mistakes, friendship, repairing the hurts of the past, and moving on into a clearer future and readers will enjoy turning the pages as they dig their toes into the sand this summer. For more information about Shelley Noble and the book, check out her website, like her Facebook page or follow her on Twitter. Takes a look at the book's Goodreads page, follow the rest of the blog tour, or look at the amazon reviews for others' thoughts and opinions on the book. Thanks to Trish from TLC Book Tours and the publisher for sending me a copy of the book for review. The cover and the title pulled me in before I even read your terrific review. Thanks for a wonderful review. This book sounds quite good. This is the kind of book I want to read by the pool in the summer, and let my mind just float away.